Twelve enchanting stories. Because it’s not all about Raven and Apple. The others have their fairy tales too. Now you can get inside the lives of the supporting cast from your favourite ever magical legend. It’s nearly Legacy Day, when the Ever After students will sign the Storybook of Legends. Are they destined to repeat their parents’ famous stories? Find out! 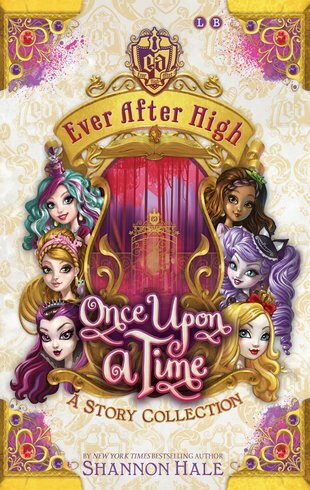 For the very first time, this gorgeous treasury collects together twelve short Ever After High stories, including five brand-new tales. Read all about Dexter and Darling Charming, Cedar Wood, Lizzie Hearts, Kitty Cheshire, Apple White, Raven Queen, Madeline Hatter, Briar Beauty, Ashlynn Ella and Hunter Hunstman. Finish off with The Tale of Two Sisters for a proper happy ending. This book has been on my wishlist for sooo long and I love Ever After High! WELL IT WAS AMAZING IT TELLS YOU ABOUT CEDAR WOOD, APPLE WHITE, RAVEN QUEEN, DARLING AND DEXTER CHARMING, KITTY CHESIRE AND LIZZIE HEARTS! I want to read it because I reckon it’s going to be awesome!!! Shannon Hale received a Newbery Honor for Princess Academy in 2006.